A little owl banner ad has been stalking me around the web challenging me to slim my wallet. Their ad targeting is incredible since my wallet is indeed uncomfortably bulgy so I was eager to find out exactly how much a difference just a wallet can make. 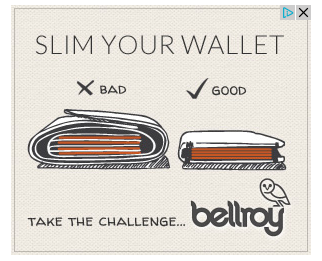 The people behind the ad is an Australian company called Bellroy. 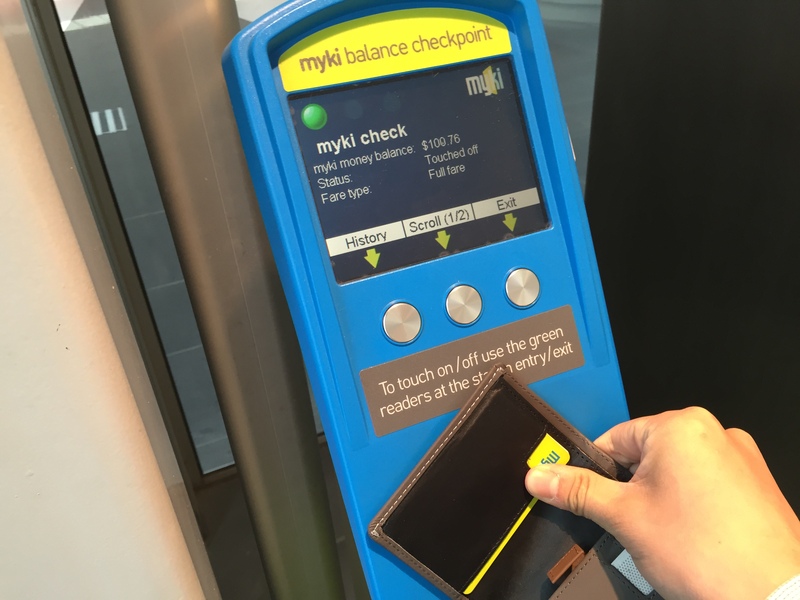 These guys pride themselves on creating slim wallets and even own slimyourwallet.com. The idea is simple, their wallet is specially designed to stack cards using less room than other wallets. Bellroy doesn’t believe in the one-size-fits-all strategy. Their range of six wallets is split between folded bills and flat bills, combined with a range of card-fitting capacities. I opted for the Note Sleeve (above) which claims to fit flat bills, coins as well as 4-11+ cards. And this is how all those things fit in my previous standard leather wallet. Although the leather and stitches have lasted about 6 years, it was certainly bulgy and uncomfortable in tighter skinny jeans. Definitely function over form. From the first impression of an embossed owl on the cardboard packaging, it’s clear this is a company that takes its materials and craftsmanship very seriously. The wallet from the outside is modestly clean with only a small emboss of the logo. The silver stitching stands out quite well on this slate-colored leather. Oh and it also has that nice real leather smell. More fine stitching and a little owl. Since this wallet fits flat bills, there’s plenty of room for bills of most Western currencies. There’s two little pouches at the bottom, one with a flap (right) and one without. Both fit coins but I’ve found the one without the flap easier to access. The little tab is Bellroy’s secret sauce for fitting lots of cards in a stack but making it still (relatively) easy to access. This means you can push in a stack of 6 cards deep into the pouch, and the tab allows you to easily slide out all of the cards for picking. And this is what it looks like after I’ve put in all my cards. My old wallet measured around 3.2cm from the thickest side. And the Bellroy measures 2.4cm from the thickest side. A saving of 0.8cm which equals to a 25% reduction over the original! Not bad for changing only just a wallet. To get a better sense of where the savings come from, this picture of the two empty wallets side by side gives you a good idea just how thinly crafted the Bellroy Note Sleeve is. What’s not picture is also how light it feels. Since there’s only minimal layers of leather, the wallet feels considerably lighter in the pocket as well. 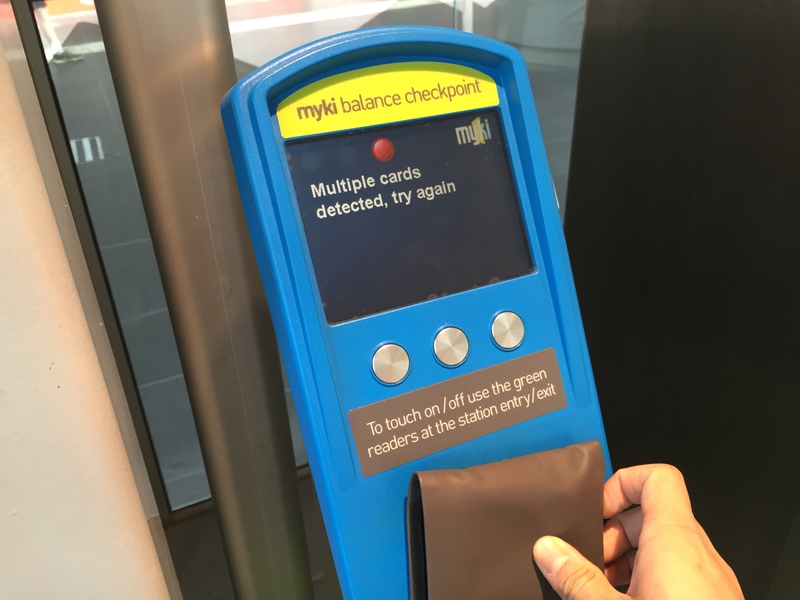 I also found getting the wallet into my pockets was much easier. I believe this is because the edges are tightly threaded forming a thin hard flap which helps the wallet slide into pockets like a hot knife through butter. In conclusion, I’m convinced Bellroy’s slim wallets work. And it’s not just me who’s convinced – when I asked people on Twitter for wallet recommendations, there was an overwhelming praise for Bellroy wallets that’s hard to dispute. At A$89.95, the Note Sleeve is a wallet worth investing in. Disclosure: Bellroy provided the wallet at no cost for the purpose of this review. Ordering one right now. Mostly because I’m sitting on my wallet right now and its a pain in the … . Sell out. Was that a free what? Did you get paid for writing this? The wallet was provided free for review. I did not get paid for the review. Do you have reason to believe, reasons which you could elaborate on, that the integrity of the reviewer has been compromised in this review? If not, why write such nonsense? That aside, it seems that those four credit cards might be a good starting point to any slimming down. PS – Considering the price of the item in question… a sample is usually provided for free. The question is whether the sample was a sample which may be kept, which would in turn raise questions, or whether it was a review sample which was returned after the review. If not, it could constitute a payment or at least a gift. This should be mentioned in the review. Fair enough. I’ll add a disclosure statement. Had mine for about a year. Nice wallet. Also has a spot to store a sim card for when you swap overseas. Have had this same wallet for a year and have never looked back. You will have the best results if you take Bellroy’s advice and use this opportunity to cut down on any non-essential cards and start cutting out coins from your spending habits! Wow Long, that’s a lot of cards! I have a Ben Sherman wallet, which opens and has a spot for 4 cards in each, then to sleeves for notes. I never carry coins. I currently have 4 cards in my wallet (licence, 2 bank cards, and a prepaid visa card). Yes, I couldn’t help noticing the ads for their products appearing everywhere. Ive been cutting cards from my wallet for a while now and their products look great. I’m buying one – just choosing between the Note Sleeve and the Hide and Seek. Good review, thanks. Opps. I realised that probably looks like spam lol. I don’t work for them, I’ve used two different Tyvek Slimfold wallets now and have enjoyed them. The edges do fray after a little, but you cannot get thinner and sturdier than Tyvek I reckon. Their newer Soft Shell wallets doesn’t have any fraying problems, but it is slightly thicker than the Tyvek ones. It would have been great to get photos making clear where you put the coins in.and how it looks and measures with some numbers of coins.